​William John Cook was the eldest son of Thomas Cook and Thirza Trinder. He was born on 25 July 1890 at Mountain Ash, Glamorgan, where Thomas was working as a miner. His brother, Albert Ernest was born in Pontypridd, before the family moved again, to Gloucestershire, finally settling in Frampton at the turn of the century with Thomas finding work as a general labourer. William was a coal cutter or miner before joining the Navy. He enlisted as a stoker at Devonport on 5 May 1909 for 12 years' service. After basic training he served briefly in the depot ship Leander, before going to sea in armoured cruisers for three years, first HMS Carnarvon, then Suffolk. On the latter ship he was disciplined for the only two occasions of his career (three and five days in the cells). In 1913-14 he served on the battleship Centurion (along with Herbert Charles Drayton); following further training he joined the sister battleship HMS Ajax in April 1914. Promotion to the rank of leading stoker came in May 1915, then his ship was one of those engaged at Jutland (31 May-1 June 1916), albeit not heavily (she fired at the German Fleet without identifying any hits, and received no damage herself). William gained further promotion in March 1917, his final rank being that of stoker petty officer. He left his ship in May to spend the rest of the war in HMS Blake, depot ship for the 11th Destroyer Flotilla. William Cook was at training establishments for a year from January 1919, presumably as an instructor, before his last seagoing posting to the modern battleship Valiant, from which he was finally discharged on 20 June 1921, on completion of his term of service. He was awarded the 1914 Star, British War Medal and Victory Medal, and is commemorated on the plaque in the village hall. William and his wife Elsie had two children, Leslie and Gladys. 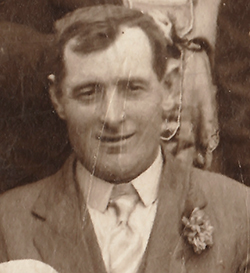 William John Cook died in Cirencester.